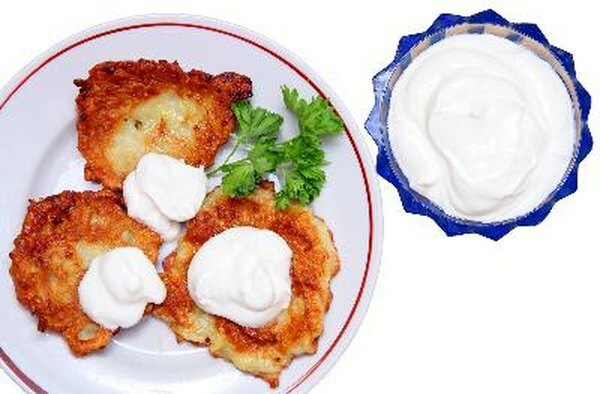 Sour cream -- light cream thickened and “soured” by inoculating it with bacterial cultures -- makes regular appearances in Mexican, Russian and German cuisines. It can be used as a garnish, and you'll also see it used as a substitute for mayonnaise or as a base for creamy salad dressings. No matter how you use it, it offers many nutritional benefits but also contains a lot of fat. If you are concerned about your protein intake, consider adding sour cream to your diet – a half-cup serving contains 2.4 grams. This quantity contributes a small amount to the 46 to 56 grams of protein you should include in your meal plan each day. Your body uses the protein in sour cream to generate energy to keep you moving throughout the day. It also bolsters your immune function. A half-cup serving of full-fat sour cream contains 23 grams of fat, which includes 13 grams of harmful saturated fat. Because this fat not only packs in the calories, it harms your cardiovascular system, you should opt for reduced-fat sour cream when possible. A half-cup of low-fat sour cream contains 15 grams of total fat and 9 grams of saturated fat. Sour cream is a good source of calcium, a mineral your body needs to boost bone health. Each half-cup serving of sour cream provides 13 percent of the daily recommended intake of calcium. In addition to its benefits to your skeletal health, the calcium in this condiment is vital for the function of your nerves, muscles and heart. One serving of sour cream provides 12 percent of the daily recommended intake of riboflavin, also known as vitamin B-2. Your body does not produce or store riboflavin, so it is important to get the amount you need from the foods you eat, such as sour cream. While riboflavin is associated with converting food to energy, you also need it to make the vitamin B-6 and folate you eat ready for your body to use. Additionally, your body depends on it to boost red blood cell counts. Consume a serving of sour cream and you take in 13 percent of the phosphorus you require each day. You need phosphorus for bone health as well as turning macronutrients into usable forms. The phosphorus in sour cream works in conjunction with B vitamins to keep a variety of bodily processes working smoothly, including your kidney, muscle and nerve function. A serving of sour cream introduces 6 percent of the vitamin B-12 you need daily into your diet. This vitamin keeps your nerve cells healthy, and it may also benefit those with certain autoimmune function conditions. Research published in the April 2011 issue of the “Journal of Epidemiology” indicates that consuming a higher-than-recommended intake of vitamin B-12 may prevent the onset of active Systemic Lupus Erythematosus, an autoimmune disease that attacks the skin, joints and kidneys.